Moong dal recipe with step by step photos. restaurant style moong dal fry recipe for roti, jeera rice. I often make north Indian style dal fry recipes as they are tasty and healthy. This delicious dal recipe made with moong dal is something I make at least twice a month. This restaurant style moong dal fry is not bland unlike south Indian moong dal that we make. 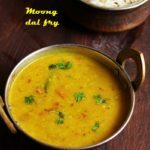 Many of us detest mung dal masiyal as it is very bland and pasty 🙂 Do try this moong dal fry recipe which is flavorful and healthy as well. This moong dal recipe is suitable for toddlers and kids too. Easy to digest, healthy and wholesome recipe of mung dal for everyone. When making for babies and toddlers, kids you can add pepper powder instead of chilies. Moong dal is easy to digest and often preferred when light diet prescribed. As I have mentioned in my khichdi recipe mung dal is a lentil packed with nutrition. It has lots of mentions in ancient ayurvedic medicine. It balances the three doshas (vatha, pitha, kapa) and helps in cleansing the intestine. Both whole yellow green gram and husked split yellow mung are used in various Indian recipes. Now this simple dal fry recipe tastes so good when served hot. If you are looking for more dal recipes do check rajma, dal tadka, dal makhani, dal fry , dhaba dal recipes. How to make moong dal fry recipe with step by step photos. Rinse and add the mung dal into a pressure cooker. Add 3 cups water and cook until done. It should be mushy and smooth. Add cumin seeds, curry leaves, slit green chilies, ginger garlic. Fry till raw smell goes off. Add tomatoes and saute well till mushy. Add the cooked dal and 1/2 cup water. Mix and simmer for 5-7 minutes. Add more water for thinner mung dal. Add kasuri methi, coriander leaves and mix well. Serve mung dal hot with rice. Moong dal fry recipe with step wise photos. Split yellow moong dal cooked and tempered with onions, spices and herbs.